The ElectroFried is a game with a shocking fun level. ElectroFried is developed for the Global Game Jam 2011 in Antwerp in design center the winkelhaak. The Team Jekkos/ Cinezaster decided to make a simple game based on colliding electrons. With a nasty side effect, a electro shock. As a input devised I hacked a old computer mouse to control the electron and bring it to the proton without colliding with the other free spinning electrons. A transformator of a disposable camera is used to generate high voltages on the input mouse. 5 leds are used to show witch level you are and show animations in between. The controller is a old mouse. I removed almost everything inside and soldered my wires on the switches of the buttons. On the arduino side there are pull-down resistors to keep the input level LOW when no switch is triggered. For the shocks I gutted a disposable camera and sourced the transformer out of it. The transformer is a step up transformer. 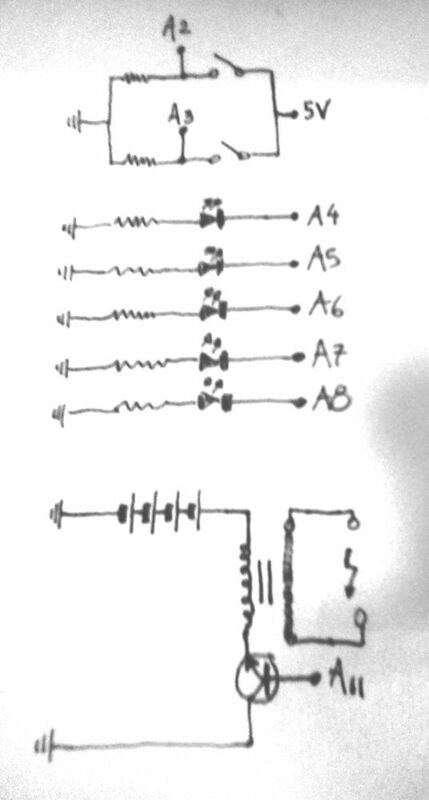 I used a power NPN BD139 to generate some kind of alternating current through the transformer. After messing around with the components that came from the camera. I switched to a more software generated alternation. I used the tone function of arduino to generate a 50000 Hrz signal, this delivers about 1000 Volts. 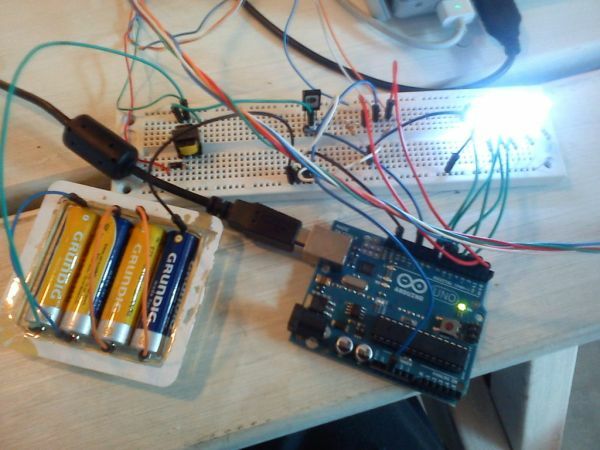 I used batteries to power because the frequencies could interfere with the arduino. 5 leds to animate, I used 5 digital outs to interface. This is the arduino Code. It’s serial connected over USB and talks to our JAVA game. The zip file contains the java game.